Determination of the Mechanical and Technological Properties of Metals presents the principal types of testing machine and equipment. This book provides a brief description of the methods for determining the principal mechanical and technological properties of metals. Organized into three chapters, this book begins with an overview of mechanical testing of metals subdivide into static, dynamic, and fatigue testing depending of the method of load application as a function of time. This text then describes weld metal working under tensile loading conditions. 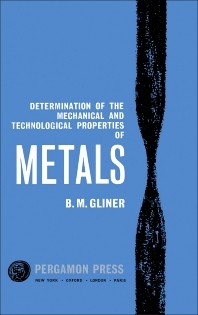 Other chapters consider the various methods for the determination of the technological properties of metals, including longitudinal turning method and face turning method. This book discusses as well the methods of determining the machinability of metals, including two-tool test procedure, drilling test, and temperature test. This book is a valuable resource for students taking practical laboratory courses in metal working at technical colleges. Laboratory personnel will also find this book useful.